No, my clients don’t frustrate me. My clients are some of the most intelligent and pleasant people I know. 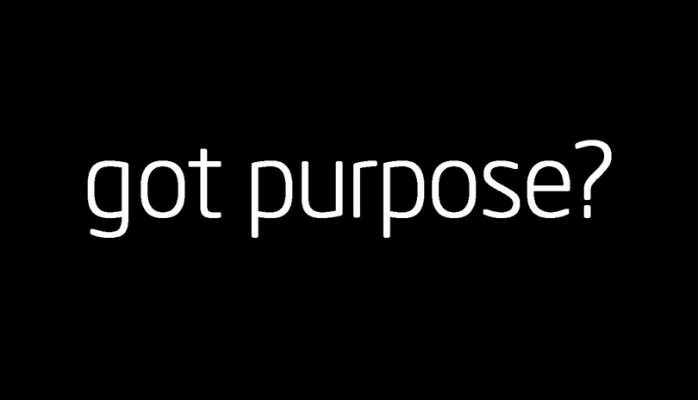 What frustrates me is the misconception that branded products don’t have a clear purpose. I so strongly believe that promotional items can do wonders when chosen with a clear reason that I built a business around it. Just like anything with marketing, promotional items should have a purpose. But instead it seems the common theme moving around most businesses is that it’s simply important to have branded items. If you asked most executives what the point is of promo items, they’d tell you “branding”. Promo items should do more than just brand your company. They should be helping you bring in business, whether from a current client or prospective new one. Convinced your industry just doesn’t have any such items that could possibly help? I guarantee you I can help find at least one, if not multiple, custom promotional products that won’t be purchased simply just because, but with a purpose: whether it’s to bring in new business, convey sincere appreciation to a loyal client or any other targeted reason. 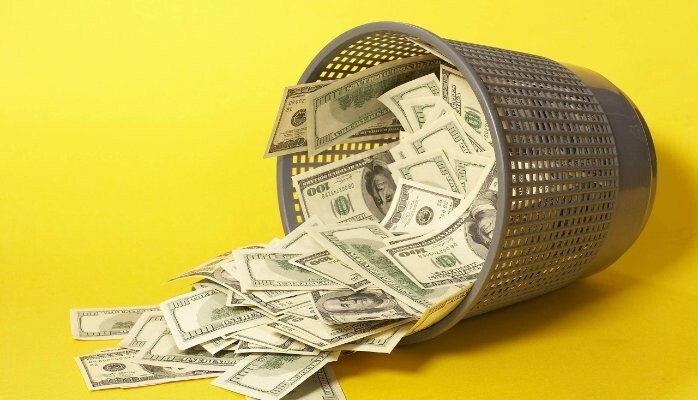 Are You Throwing Away Money With Promotional Products? I know, I know. The title of this article goes against everything my business stands for. But let me explain…. Ever go to order a promotional product and feel lost among the countless choices? Wonder what product is really going to bring leads to your door? And then you go: “A pen. I’ll get a pen. Everyone uses pens”. A true statement, but is a pen really what’s going to get people calling you? A pen may be the perfect thing for certain companies to meet their goals. But for others, it’s simply a waste of money. A slightly higher priced object given to a more selected targeted audience could give you results you only dreamed of. Or it could be an object that answers the question of “What is going to make potential customers to contact me?”. Don’t continue to purchase promotional products without first thinking about how exactly it’s going to benefit your company and help you achieve your goals. Not sure which products would be best for your company and goals? That’s where LeRoe comes in. We can help with branding and the selection of promotional products to give you results you can see. Get in touch! Many people will tell you direct mail marketing is dead. But a recent campaign with a 73% appointment rate on average makes me think “maybe they aren’t doing it right”. Here’s what I do differently than most: extremely focused campaigns. We all have a list of people and companies we would love to see become clients. Custom direct mail pieces with the right message can get you the foot in the door you need. 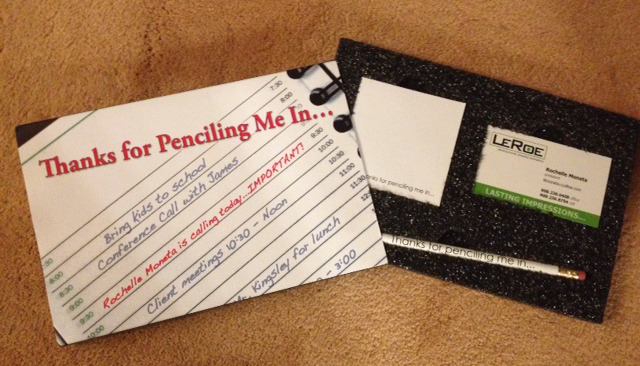 A hugely successful direct mail campaign is our "Pencil Me In". The mailer was a custom piece with packaging that showed a day planner with my name printed in a specific time slot. Once the mailer was opened, my business card was inside along with a pencil and a sticky note pad that said “thanks for penciling me in”. I’d follow up with a phone call at the time printed on the packaging and almost every time was able to speak to the contact and schedule an appointment. That mailing generated a lot of business for me and all I had to do was make sure to follow up on the mailer. Direct mailing, if done incorrectly, can absolutely be a waste of time. Without a targeted message going to the right people, you may not get any return. But with a little creativity that helps you stand out you’ll get the opportunity to connect with those on your most wanted potential client list. Looking to get appointments with a targeted group of prospects? Get in touch and I’ll show you how to make it happen with a custom mailer.